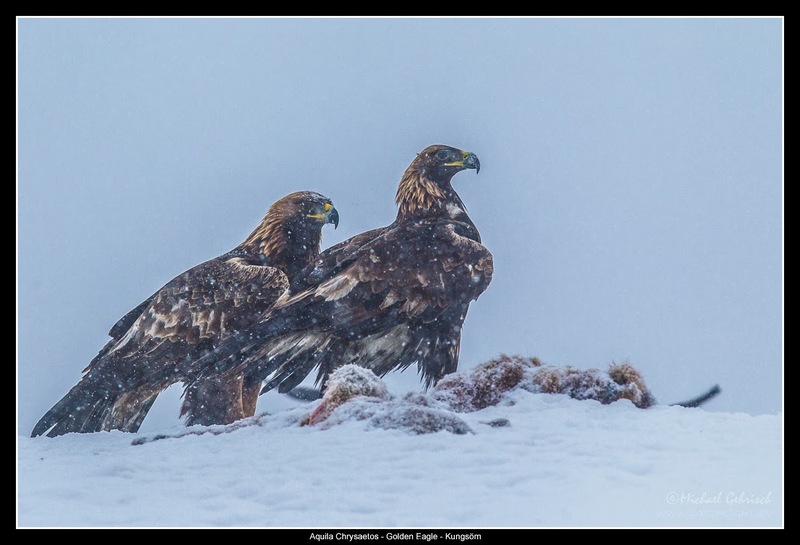 Even though I already had 2400 pictures of golden eagles which I was really happy with, when I got the opportunity to join Felix Heintzenberg on a 3 day trip to Norway to photograph more golden eagles, I just couldn't resist. So after landing in Oslo at 9:30 we picked up our 4wd rental car at 10.00 and started driving to Dalen in Telemark, a place so remote that my GPS said there are no streets there. Thanks to back up guidance from Felix we managed to find our guide's home at 3.00am. Jostein had said to give him a call when we got there, and a bit hesistantly we called and got... voicemail. Grrrrr. Now what? Sleep in the car for an hour and a half before getting up to head to the hide? We knocked on the door; carefully at first and then a little more insistenly. Still no answer. I checked the door, it was unlocked. "I'm going inside and sleeping on the couch". Felix followed me in and we were met by two extremely well behaved retrievers who refused to bark or leave there beds, but their tails were wagging so hard it was hard to ignore while trying to fall asleep. Jostein finally heard all our noise and came and greeted us. His phone had run out of juice without him noticing he explained sheepishly. We tried to sleep a few more minutes, and at 4:30 we finally got up and had some breakfast before packing our gear and loading it on to Jostesin snowmobile and sled. Felix volunteered to ride on the sled with the gear as we started the 15 minute ride to the top of the mountain to the eagle hide. I kept looking back to make sure Felix was still there. Near the top of a very steep hill the snowmobile just started spinning its track, so we both had to jump off and walk the last 15 meters up the hill. The brisk wind and a lot of snow down the back of my neck woke had me fully awake and the all night drive seemed almost forgotten. We finally reached the hide, loaded in our gear and hurried to get everything set up while it was still pitch black to avoid scaring off any eagles or ravens that might be able to see us. We had two cameras and lenses each, and once they were in place, pointing out of the hide, they could not be removed until it was dark to avoid scaring the eagles. At 8:30 there was finally enough light to being to photograph, but so far only the ravens were to be seen, and care must be taken not to scare them. They are a sign to the eagles that everything is safe. 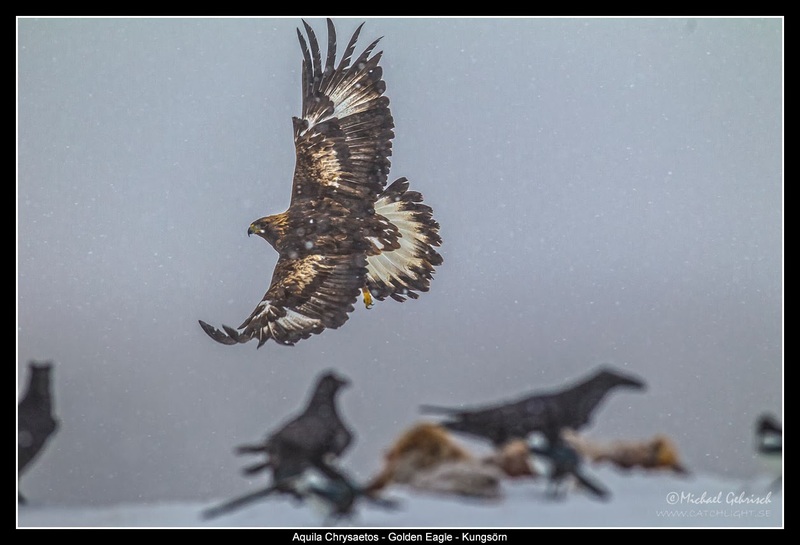 Finally at 9:00 the first eagle made a cautious approach and sat on a tree top at a safe distance, but they were cautious and only stayed a few seconds at a time. As the day wore on and it became afternoon the eagles came and left several times and extended their stays, Felix and I took turns napping between eagles visits. 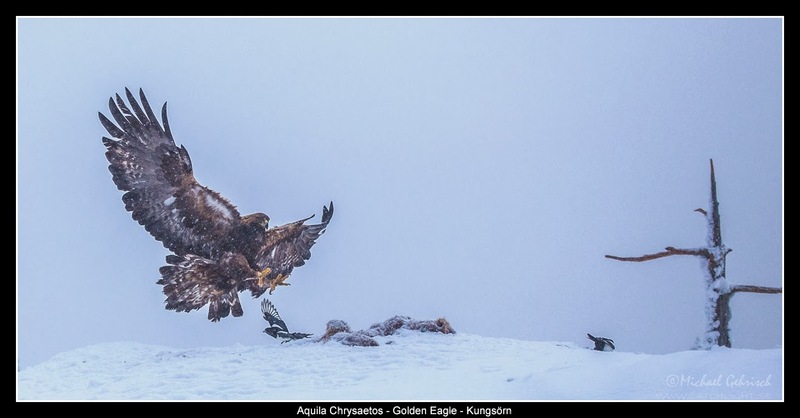 Most of the eagles fed individually and if a second eagle landed it usually meant there was going to be a fight. But there was one pair of eagles that was obviously a couple since they ate and flew together. In little more than a month the female would be sitting on their nest incubating two eggs that will hatch around the beginning of May. The weather changed from snow to clear to fog to more snow and finally the light disappeared again at 5:00pm while a final eagle took a few last scraps of meat to tide him over until morning. The days result was 360 images, a few of which made the long day in the hide worthwhile. We packed up our gear and waited for Jostein and his snowmobile to take us back down the mountain. By the time we got off the mountain, ate dinner and had a quick review of our pictures we were ready to pass out from lack of sleep. We made an early evening of ate and before we knew it the alarm was ringing to tell us it was 4:30am and time to get up. 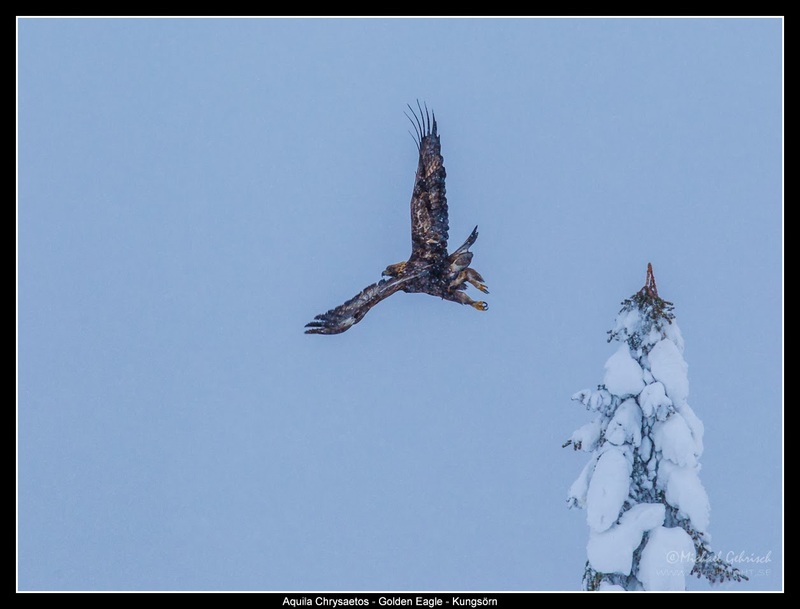 Our second and final day in the hide was much slower, fewer visits and poor light, but nature is fickle and golden eagles show up on their own terms. Nonetheless I took 260 images and filmed the eagles as they ate 25 yards from us. We loaded our car with our gear and prepared for the the five hour drive back to Oslo. 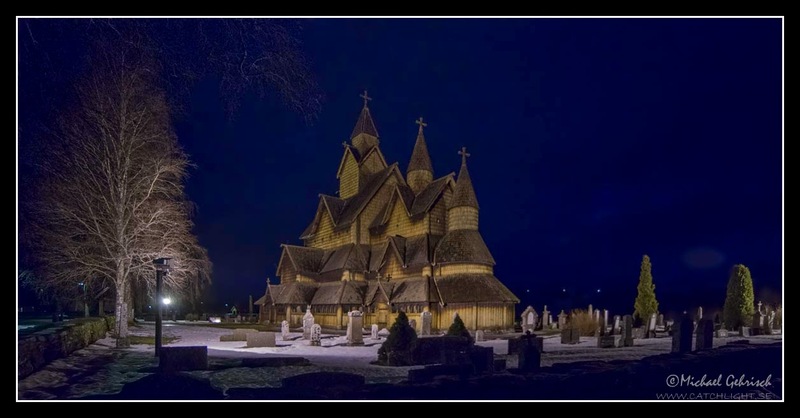 On the way we passed a wooden church and thanks to the full moon the sky still had a blue tint despite the fact that it was 11:00pm. We finally reached Oslo at 1:30 where we grabbed a few hours of sleep before catching a 7:00AM flight back to Copenhagen. 2400 bilder...? Hittills har jag möjligen samlat in de första 24, av varierande kvalité. OK, jag vet att du varit i Norge fler gånger, men ändå. Måste varit ett äventyr, hoppas du visar fler bilder. What a beautiful blog and stunning photos! I've listed your blogsite URL in my Blog Roll. Hope that's OK.